Favorite food: Whatever he can get to before Courtney elbows him away from the food bucket. Favorite activity: Playing with little stuffed animals and hand puppets. Whoop-Whoop came to IPPL in March 2007 from another sanctuary where he had lived for four years. That facility was experiencing financial and other difficulties at the time. Before that, Whoop-Whoop had been used for research at a notorious primate lab in Louisiana, the New Iberia Research Center, which was exposed in 2009 by a Humane Society undercover video showing the mistreatment of the some of the 6,000 primates who were captive there. We don’t know his age, but mild-mannered Whoop-Whoop seems like an older animal. In May 2009, we put him together with Courtney, a surprise baby born at IPPL in 2002 and hand-reared after her mother rejected her. We weren’t sure how Courtney would react to being placed with another gibbon after being around humans for so many years, and we thought sweet Whoop-Whoop would at least be nice to her. Courtney was sometimes a little nervous around him at first, but after some months she gradually lost all fear of him. If anything, we sometimes pity poor Whoop-Whoop when Courtney gets into one of her wild moods and starts playing with him too roughly. Maybe that’s why he enjoys wrestling and slap-fighting with his human friends: they tend to be gentler than Courtney! He also likes to watch TV, which we turn on for our gibbons especially on cold days when they have to stay indoors. He seems to enjoy PBS childrens’ cartoons (like Dinosaur Train and Super Reader) and will “hoot back” to the set. 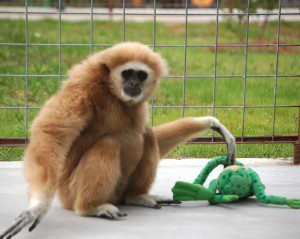 Gibbons, with their long hands and fingers but short thumbs, are not terribly dexterous, and many of them do not care to play with or manipulate objects the way a chimpanzee or capuchin monkey would. Whoop-Whoop has always appreciated toys, however, and even arrived at IPPL accompanied by what looked like a little rubber alien. He especially likes stuffed animals and inexpensive cloth hand puppets—which he consistently turns inside-out. He likes to groom them, bite on loose threads, rub them on things, put them on his head, carry them about, or just sit there holding them. Courtney sometimes shows an interest in Whoop-Whoop’s accessories, too, and we just have to keep our fingers crossed that she won’t destroy them!